Used by beginners and professionals alike, the CDA #222 Throttle Power Pack is designed for single Train operation with sufficient power to double-head locomotives and operate accessories. 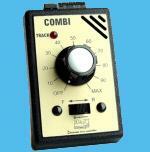 Single Track Transformer and Controller for N, OO and most small Gauges. An uncomplicated controller which comes complete with a separate, dedicated transformer plugging directly into a wall socket with a 1.8m lead to plug into the controller.